Whether you need a one-of-a-kind graduation gift for a high school graduate heading off to college, a college graduate or someone earning an advanced degree, it can be hard to find a graduation gift that is practical, personal and unique. Hand-stitched needlepoint college campus belts check all those boxes. Brewster Belt Company’s custom needlepoint belts can be worn casually with shorts and jeans or dressed up with slacks or suits. Each belt is made from the highest quality materials including top-grain leather and solid metals designed to last for years. Brewster’s needlepoint belts are hand-stitched and comprised of up to 15,000 individual stitches. These timelessly preppy belts are suitable for nearly any occasion. It doesn’t get more personal than this. 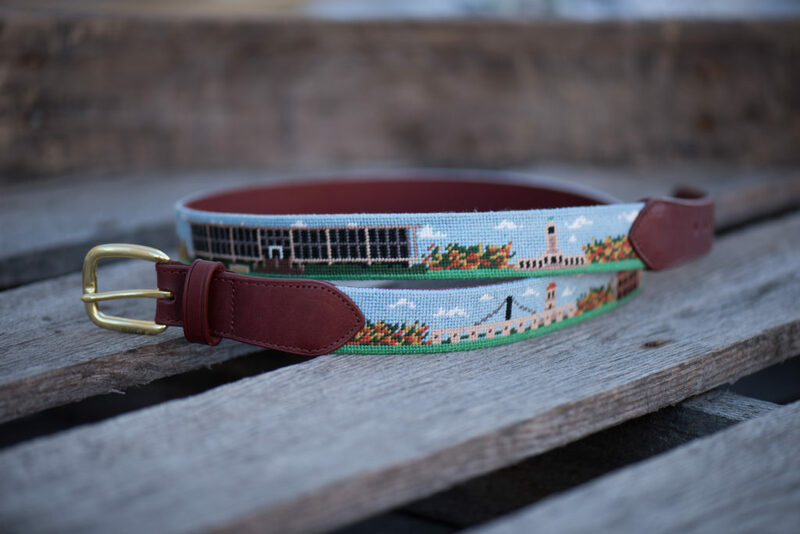 Each college campus needlepoint belt features a detailed, hand-stitched landscape of each college’s landmark buildings and other memorable features. You can also customize the belt by adding a monogram (the graduate’s initials) or graduation year and by selecting the leather color (black, brown or tan) and metal buckle color (brass or silver). Brewster’s experienced designers will work with you to perfect your custom design, so you’re completely happy with your design before our artisans start stitching your custom gift. If you search for “unique graduation gifts” on Google, you’ll get some interesting suggestions. Unique can be “good unique” or “a little out there unique.” A custom campus needlepoint belt as a graduation gift is just unique enough to stand out, but not too unique that it will get put in the back of a drawer and forgotten about. Brewster’s custom needlepoint belts are an interesting conversation piece and a unique reminder of a graduate’s academic accomplishments and fond collegiate memories. To order a custom college campus belt, simply select the belt size and other custom details on our custom college campus needlepoint belt product listing. Once you place your order, a designer will contact you to finalize all of the details and will provide you with a proof of your design for your approval. Please note that in addition to needlepoint belts, we also offer wallets, flasks, key fobs, pillows and other custom, hand-stitched needlepoint items – all of which make great graduation gifts! Check out BrewsterBelt.com for a complete product listing and design ideas.